Now, I’m no expert, but as I understand it, Thursday follows Wednesday and precedes Friday in the standard understanding of what makes a week. This year, Christmas — you might have noticed — falls on a Friday. So, if you’re the NFL, obviously that means Thursday Night Football right! Was Friday Night Football too difficult to say? I can’t wait to watch Monday Night Football Saturday afternoon. I’d say I’m surprised but this is the NFL Network we’re talking about and their ineptitude is legendary. Among the other things being cracked down on the beach, (thanks in no small part to new consultant Rudy Giuiliani) are the vendors selling shrimp or cheese on skewers, as well as radios and coolers also being banned from the sandy shores. Of course, Rio citizens are rebelling against these regulations and are continuing to enjoy the beaches as they have for decades. 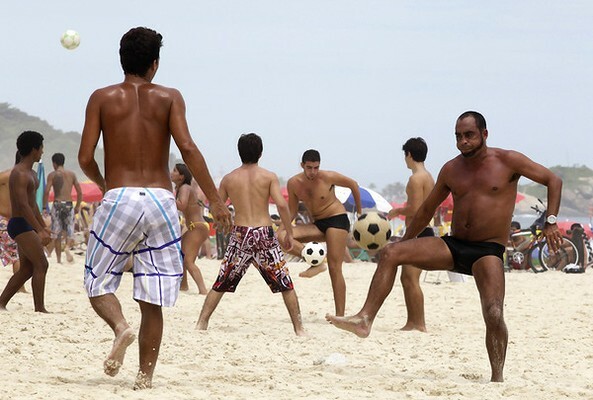 In the meantime altinho games pop up all over the place and remains a favored beach activity for skimpily-clad Brazilians everywhere. Good thing, the Olympics are a mere 7 years away! As the Tiger Woods story continues to dominate news coverage and becomes the most important story in the history of news, today’s news that Elin intends to divorce Tiger has already sparked bookies to start setting odds. Right now, British bookmaker William Hill already have odds up on the settlement that Ms. Nordegren might receive. Currently, bettors get 25:1 odds that she’ll receive MORE than half a billion dollars. Among the other options are 6:4 odds for her getting under $100 million and 1:2 that she gets between $100-500 million. Really, what level of degenerate gambler are you if you find yourself wanting to get in on this kind of action? Budweiser’s favorite baseball team, the St. Louis Cardinals are working really hard to maintain their status as America’s Drunkest Team with their latest infraction, scrubby third baseman David Freese’s arrest for a DWI in Maryland Heights, about 20 miles out of St. Louis. 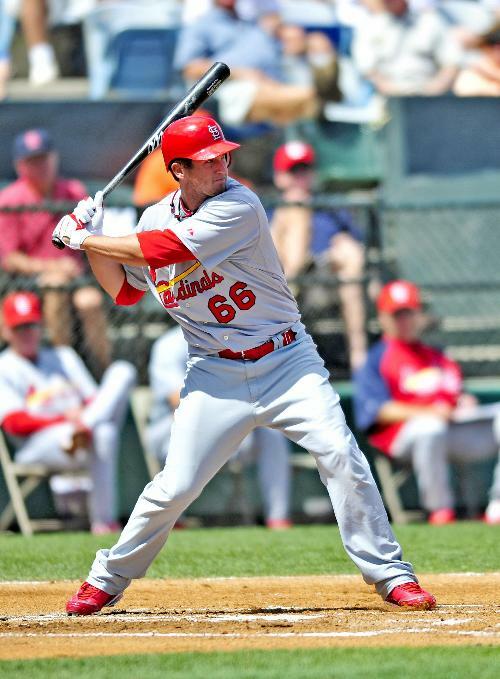 This makes the 4th incident in three years where a member of the Cardinals has been hit with drunken-driving charges. Starting with manager Tony LaRussa’s blowing a .093 BAC and falling asleep at a traffic light to Josh Hancock’s death after driving drunk to Scott Spezio’s DUI arrest, clearly the Cardinals are taking this issue VERY seriously. I bet they almost thought about sending an email to their team and staff, and then thought better of it. But still, ALMOST! The 26-year-old Freese was not involved in an accident, thankfully, but the police wouldn’t release further details about the St. Louis native’s arrest. He is expected to be a prime contender for the starting third base job in 2010. I’m glad to see the team that plays in Busch Stadium and is sponsored in large part by Budweiser has taken a stand against drunk driving and alcohol abuse. That’s a bang-up job there guys. Trevor Ariza was 0-9 from the floor during Sunday’s Rockets/Raptors game and was obviously feeling very frustrated. After battling for a loose ball, he lets his annoyance bubble over and tries to take a swing at DeMar DeRozan. Showing that his struggles on the court weren’t an illusion, Ariza whiffs on connecting with his punch too. Unluckily for him though the refs caught him and he was immediately tossed out of the game. 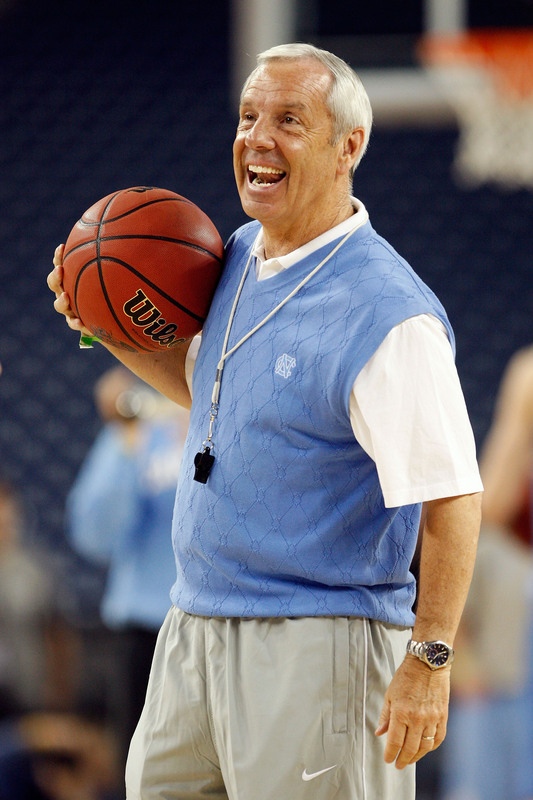 University of North Carolina’s men’s basketball coach Roy Williams thought it was important to teach his charges the true meaning of class during Saturday’s rout of Presbyterian College. Sure the final score was 103-64 but that doesn’t mean life-and-death don’t hang on every play. So, late in the second half, with the game already well in hand, two police officers conferred with Williams before climbing through the stands about 20 rows up from the UNC bench and removed a fan (video of it HERE). The man, who was wearing a shirt with the Presbyterian College logo had drawn the ire of Williams after heckling UNC’s Deon Thompson while he was shooting foul shots with 6:45 remaining in the game. “Hey Deon, miss it,” the man screamed. “When an idiot runs out on the field, they don’t show the idiot running out on the field because it just gives them more publicity,” Williams said following the game. “I don’t think anybody should yell anything negative at our players. Period. Yeah, because running on the field and possibly endangering the players is EXACTLY the same as heckling from 20 rows up during a foul shot. Also, I’m sure the UNC crowd was silent and respectful during any of the Presbyterian players’ foul shots. A North Carolina spokesman Steve Kirschner later said police “believed” the fan in question to be drunk and he had been asked to move because he was not in his ticketed seat. Riiiiiiiiiiigggggghhhhhhhhttttttttt. If you believe that than probably think college basketball is interesting and good basketball. 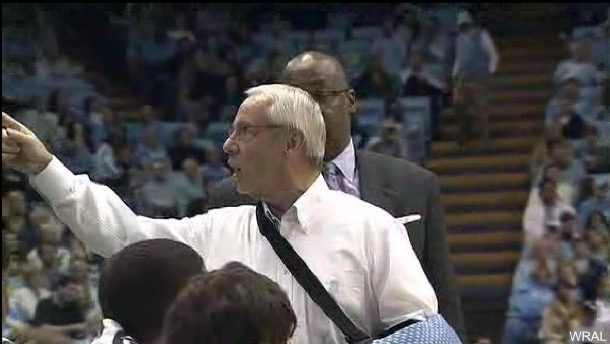 Or it could just be that Roy Williams, for this one moment at least, was a giant douche-fascist of the highest level. Either way. SHOCK! 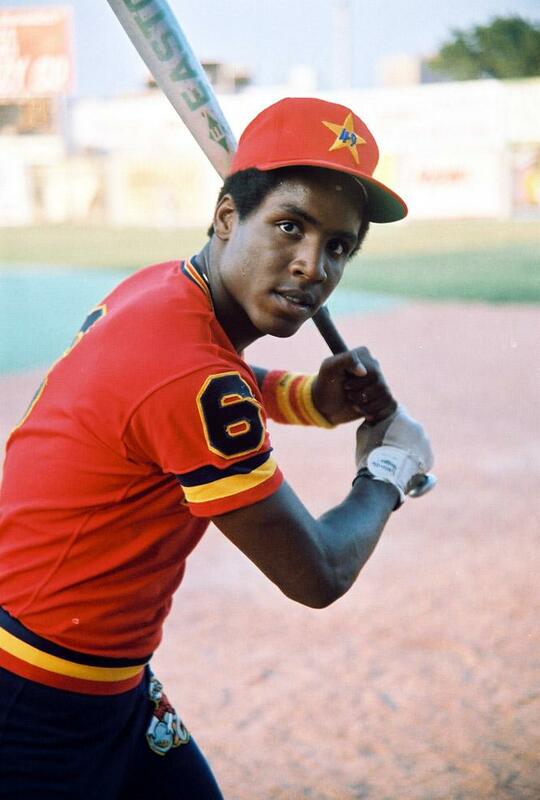 Barry Bonds’ Career is Over! Jeff Borris, the agent for erstwhile San Francisco Giant Barry Bonds is apparently the last one to realize that his client’s career is over. While Bonds is still not officially retired, “It’s two years since he played his last game, and if there was any chance he’d be back in a major-league uniform, it would have happened by now,” Jeff Borris said. Sure, it’s somewhat unfortunate, but had Bonds been willing to sublimate his ego and accept a far-reduced salary he probably could have caught on with someone in 2008. Because he was unwilling to accept that his very presence causes a whole host of problems for his club, and that those problems translate to less salary for him, Bonds was left without a job. 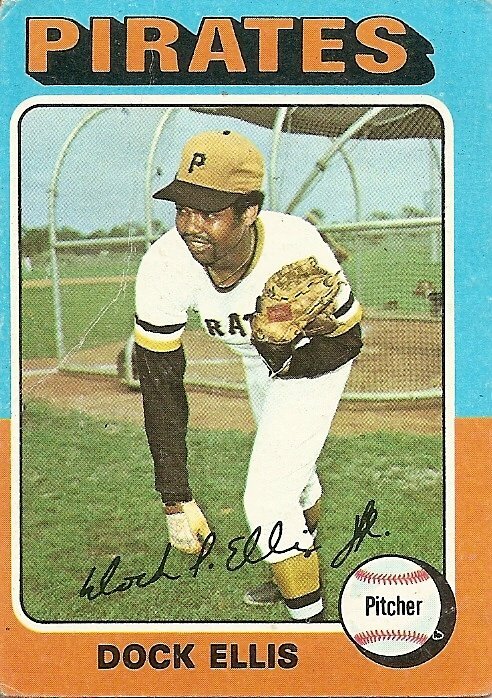 It’s somewhat of a shame, he could probably still walk onto a field today and post up a OPS over .900 and sock 20 HRs in limited service. That’s the way megalomania goes, I suppose.